If you’re looking for all-day brunch, this is the perfect spot. This new spot located on Whyte Avenue may have recently expanded its hours, but the menu still remains primarily focused on all-day breakfast and brunch items – and we couldn’t be happier about it (is there ever a bad time for brunch?). Many of the condiments are crafted in-house, such as the house-made peanut butter and house-whipped cream cheese – and Rooster makes sure to source locally whenever possible. You’ll find familiar names like Four Whistle Farm, Fruits of Sherbrooke and Fuge Fine Meats Inc. on the menu. The bagel boards are definitely one of the highlights. Bring a friend and go for the Rooster Platter, which gives you a choice of two bagels (the varieties change on a regular basis), two cream-cheese picks (you can select from original, scallion and lemon dill), some Sgambarro’s Atlantic smoked salmon and a sampler of the two house-cured gravlax offerings – beetroot fennel and lemon coriander. 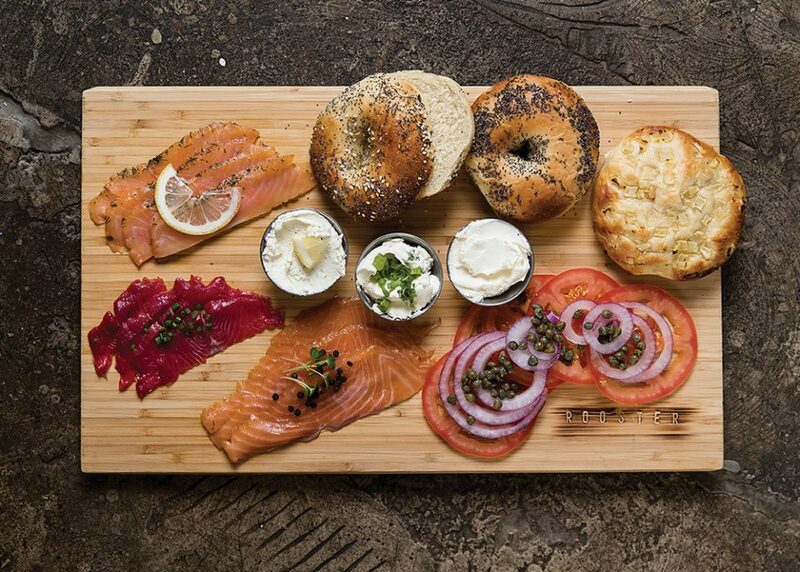 And, if that weren’t enough, the board also comes with tomatoes, red onions, capers and cucumbers, so you can build your perfect bagel-centric breakfast. Add a cup of bottomless coffee to your order, made with local Iconoclast beans, and you’ve got a perfect brunch any day of the week.